Perfect for the kids and the kids-at-heart. Nothing gets the kids more excited than a trip to the amusement park, and America’s got some great ones. But that kind of vacation can get very expensive, really fast. The good news is that an easy way to save money is to skip the hotels and restaurants and stay in your RV instead. Even more good news is that many theme parks actually have their own campgrounds, or are at least located near one. This is a list of some of our greatest campground-friendly amusement parks. Wisconsin Dells isn’t the name of a park; it’s a city. And it’s on this list because it has the highest concentration of water parks anywhere on the planet, making it the self-entitled “Waterpark Capital of the World.” There are seven water parks in the city, both indoor and outdoor, which makes this a viable option for any time of year. And in case you get tired of playing in the water, there’s adventure parks, mega-arcade centers, lots of outdoor attractions and a vibrant downtown. There are plenty of campgrounds in the area, including many RV parks. We love Bonanza Campground, with its secluded forest campsites and awesome deals on passes to parks with 2-night stays, and Holiday Shores, which is almost a waterpark in and of itself, with its lake complete with jet skis and a floating playground. The Los Angeles area has a lot of amazing theme parks. Universal Studios Hollywood is there, as well as Six Flags Magic Mountain, which recently beat Cedar Point’s record for most roller coasters. Knotts Berry Farm is an old-fashioned and gentle amusement park in Buena Park, and of course Disneyland is just a little farther south. All four can be found along a 60-mile stretch, which adds up to a lot of awesome day trips. Camping in Los Angeles gets a little tricky, however. You'll have to be willing to do some driving. Bonelli Park is only 25 miles from Disneyland. There are also a few RV parks, especially in Anaheim near Disney, but for real camping options you can head for the mountains. If you're willing to drive in and out of the city, the Chilao Campground in the Angeles National Forest is a beautiful spot, and well worth the drive. Cedar Point in Sandusky, OH is one of the oldest amusement parks in the country. There are eighteen coasters currently in operation at Cedar Point— enough to keep even the most adventurous thrill-seekers entertained for a weekend! This place is truly epic, and it’s the most visited seasonal amusement park in the U.S. Besides the roller coasters, the thrill rides, and the life-size animatronic dinosaurs (yep, dinosaurs), Cedar Point is a great vacation destination all on its own. It’s located right on Lake Erie, so you can enjoy the usual beach activities, too! Most importantly though, they’re another amusement park with their own campground, Lighthouse Point. It’s close enough to walk to the park, although there is a shuttle if you prefer. 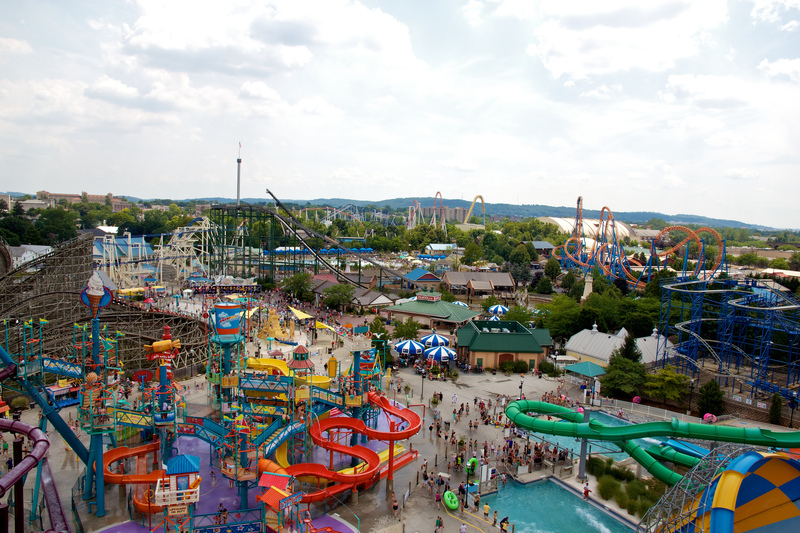 Visit Hersheypark, also known as the “Sweetest Place on Earth”, in Hershey, Pennsylvania! Make it educational by taking a tour of the chocolate factory next door, then burn off the extra calories by spending the rest of the day running from one awesome ride to the next. The park boasts seventy rides, including thirteen roller coasters and twenty kiddie rides, a waterpark, and an 11-acre zoo, plus Hershey's Chocolate World. Be sure to ride the Wildcat, a classic wooden roller coaster. Plus, they have their own campground, Hersheypark Camping Resort, and entice campers with discounted park tickets, a free shuttle and fun seasonal activities. It’s impossible to talk about American theme parks (or even theme parks around the world) without mentioning Orlando. Walt Disney World is there, of course, and it’s possible to fill a week without leaving the resort. But you’ll want to, because Harry Potter is waiting for you at Universal Studios Orlando's The Wizarding World of Harry Potter! The good news is that there’s a surprising number of camping options. Most obvious is Disney’s own campground, Disney's Fort Wilderness Resort & Campground. You won’t be roughing it by any means, as some of the amenities include cable TV and internet. The Magic Kingdom Park is just a complimentary boat ride away, so it’s certainly one of the most convenient options. If you’re looking for something more economical, however, Orlando’s Winter Garden Village is another good choice. Dolly Parton’s amusement park is a huge draw for tourists in Tennessee, and for good reason. The park has the usual rides and roller coasters, of course, but anyone who’s ever been there will tell you that the experience is so much more than that. Brilliant musical acts and shows, wonderful festivals throughout the year, artisan shops where you can watch the artists at work, and excellent southern-style dining make Dollywood a destination for all ages. The park doesn’t offer its own campground, but it doesn’t need to. It’s located at the entrance to the Great Smoky Mountains National Park, and camping options abound. One of the best places to put it in park is the Smokies’ Elkmont Campground— 200 sites means you don’t have to stress about it being booked up, and the location is right near one of the park's coolest features: the abandoned resort village of Elkmont! Whether you're looking to get wet and wild in Wisconsin Dells, or you're ready to have a magical time at Disney World, an RV adventure to a theme park can provide days of excitement and adventure for everyone!